LAS VEGAS – January 7, 2019 – TP-Link®, a leading global provider of consumer and business networking products, today at CES launched its new series of AX products powered by Broadcom’s 802.11ax (Wi-Fi 6) chipsets. TP-Link’s next generation AX product line is designed to provide blazing fast WiFi and easily handle intensive bandwidth loads, making it the ideal solution for consumers who have numerous WiFi devices throughout their home. Using OFDMA and MU-MIMO technology, TP-Link’s AX product line greatly improves WiFi transmission, efficiency and quality. As the world’s No. 1 provider of WiFi products for eight consecutive years (by units shipped, IDC WLAN Tracker, Q3, 2018), TP-Link is at the forefront of companies leading the way for the next generation of WiFi technology with its AX line. 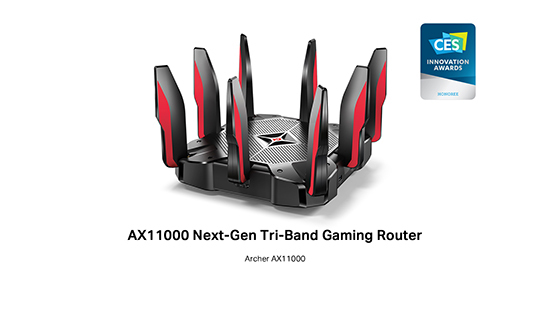 TP-Link’s new gaming series flagship, the CES innovation award winning Archer AX11000, takes WiFi speeds to a whole new level—over 10 Gbps. Its revolutionary OFDMA technology and Gaming Accelerator combine to demolish latency and interference, making it the premier router for gamers. With blazing speeds of 1,774 Mbps and higher than average throughput compared to 11AC products, and equipped with features such as 1024 QAM and OFDMA, the Archer AX1800 is the ideal choice for consumers who want Wi-Fi 6 technology at an affordable price. For consumers who are even more price-conscious, the Archer AX1500 serves as a cost-effective entry level AX option. With AX features and a highly competitive price point, the Archer AX1500 is the perfect choice for consumers who want to enjoy next generation WiFi on a budget. In addition to AX technology, TP-Link is pushing the envelope further by introducing the Deco X10 whole home mesh WiFi system. Featuring mesh technology overlaid with AX speeds, the Deco X10 is designed to provide blistering AX2700 tri-band speeds to every corner of the home with a strong and stable backhaul up to 2 Gbps. *** This combination of AX and mesh technology makes it the perfect choice for homes that want a network that can handle a greater number of devices with corner to corner coverage and minimal interference. Rounding out the series is TP-Link’s RE705X AX range extender. With speeds of 1,800 Mbps, this range extender boosts 802.11ax WiFi speeds to more rooms. **Download time may vary according to different conditions like devices, environment and ISP input speed. ***Maximum wireless transmission rates are the physical rates derived from IEEE Standard 802.11 specifications. Actual wireless data throughput, wireless coverage and maximum quantity of connected devices are not guaranteed and will vary as a result of network conditions, client limitations, and environmental factors, including building materials, obstacles, volume and density of traffic, and client location. This 1.95Gbps backhaul speed is refer to 3 Wi-Fi band speeds combined by TP-Link dynamic backhaul technology and requires at least 2 Deco X10 units to function properly.